Strong and full of flavor, this is a top brand! Looking for strong cigarettes that are full of flavor? Benson n' Hedges cigarettes might be just the cigarettes for you! The Benson n' Hedges brand was founded in London 140 years ago and has since then become popular all over the world. These elite cigarettes have a unique taste and are perfect for those who like their cigarettes strong and powerful. Where can you buy them? At Duty Free Depot, of course: the cheapest tobacco store online. If you haven't heard of Duty Free Depot yet, it's you get to know this one-of-a-kind store. Duty Free Depot is an online tobacco shop that sells a wide variety of products and accessories such as cigarettes, cigars and tobacco, e-cigarettes, lighters and spirits. The prices on the website are very reasonable, if not downright cheap. Plus, the shop often offers special deals, discounts or coupons, so checking it once in a while to see what's new can be a good idea. 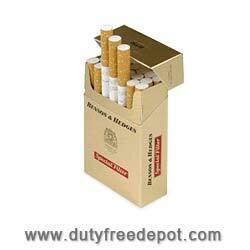 Duty Free Depot has many advantages over other tobacco stores. Not only does it offer numerous types and flavors of cigarettes and cigars at great prices, it also has a great service and a highly professional team that will be glad to assist you with every question or problem. 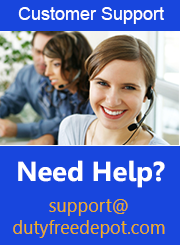 All you need to do is contact the customer service. In addition, no matter if you live in the USA or abroad, Duty Free Depot offers worldwide shipping. These qualities, along with the high reliability and speed of delivery make Duty Free Depot the best tobacco store online. Visit the website and order your favorite brand today! You will not find a store with better products, service or prices.